I want to average them, this link says that really I need to square them first, average, then find the square root. I've seen a few other points that say the same, or closer to the power of 2.2 (and a video of why computer colour is wrong). Is this really the right way to do it and what is the term for the squaring method? I know the ACTUAL best way is LAB space, but I can't be dealing with that. This will depend on your concept of "average". If it is the average between black and white, I would expect the result to be 128 and the gamma correction done by the graphics card. But the perceptual reason behind that link is interesting. The point is that there is not only one way to average, you need to remember that color space is a 3D model, not a linear one. In this post I show 4 different routes for a color transition between red and green... and that is only on a normal color wheel. But the color is not only a 2D surface but a solid, that comes in a lot of shapes, and models. How do you find an inverse colour? So, there is not just one universal way to average colors. This depends on a lot of things. Probably youd be better served under computer graphics than graphic design, since it bread and butter there and a bit too much math here. But sice you are allready here. Actually both of the reasonings are close approximations. Except it isn't quite a gamma of 2.2 because it is in fact linear under the values of 0.04045 (or below integer values of 10 in 8 bit color channels). Then because the color planes are independent you can convert it to linear first and calculate and convert back to nonlinear. * However depends on your definition of correct, if its correct as in as it work in real life then no this does not really work. Since color values used by computers cant capture natural light. You would need spectral data to do this properly. But this is a infinite rabbi thole. Color is not really as easy as most of us think, its harder than they can imagine. The Minute Physics video Computer Color is Broken is good at explaining the problem, but it done has some (small) issue. 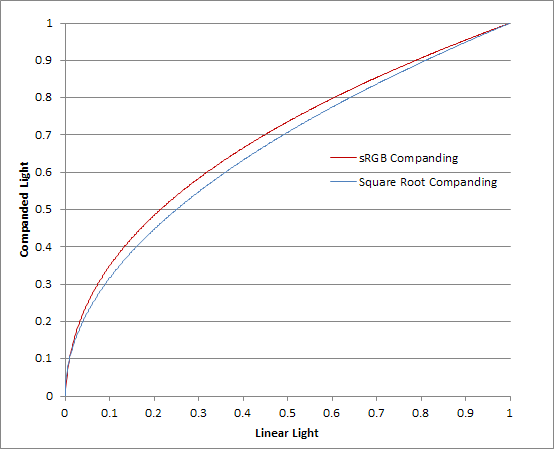 But the Internet, and nearly all electronics and consumer devices, have agreed to a standard (called sRGB), where they apply something's not quite a square root. So it's something that's not quiiiiite a square (and square root to undo it). With the only gotcha of the linear section when you get down really close to zero. Not the answer you're looking for? Browse other questions tagged color color-theory rgb or ask your own question. RGB and CMYK: Why both? How do I edit my CMYK greens to output as brightly as possible?